TOOLS OF THE TRADE: What do the fastest racers carry? One of the most common questions we get is: What gear do I use for a skimo race? While the answer can range from: Whatever you've got! to Light is right! So we thought it would be fun to talk to some of the fastest skimo racers in the country and see just what they use on race day! 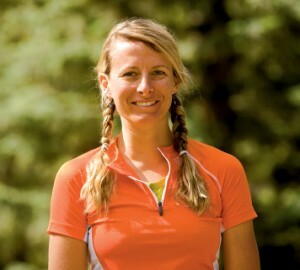 JARI KIRKLAND: Jari is an endurance mountain bike racer, elite adventure racer and has been a member of the US National Skimo Team since 2010. She races for Team gO/Crested Butte. Skins: CAMP or Trab. I wax them and ski them downhill a little bit to make them fast. I always carry 2 sets of skins and sometimes I will carry one more extra skin. I wax my skins for speed. The wax rubs off pretty quickly, but its worth it. Poles: Trab Vertical Carbon. I'm about 5'9'' and use 135cm poles. If It's going to be super powdery I might even use a backcountry pole with bigger baskets. Pack: CAMP or Trab. The lightest you can get. Must be able to put skis on while its on my back. Helmet: Trab or CAMP. I use the visor quite a bit, depending on light conditions. Goggles or glasses: I never use goggles. I use either my Oakleys or Rudy Project, cannot fog. Windshell: CAMP. They make the lightest one, it has an opening in the back for your pack so you do have to take off your backpack to put on your jacket. It's genius. Socks: Darn Tough-wool. They are indestructible. What do you wear under your race suit? Depends on the weather but if its cold I only wear the thinnest wool long johns on both top and bottom. You get and stay warmer than you would think. If its warm at all I might wear a tank top (still wool put super thin) and maybe boxer briefs on the bottom. I wear a buff on my neck that I can pull up if I need. And if its cold I will wear a wind proof head band. Gloves: CAMP or Trab. Anything that has the wind barrier that I can put on if its cold or tuck away if its warm. I've had cold hands a lot. It never last long though. How much drink are you carrying? What mix? I carry a water bottle with GU Roctane in it. But I recommend using what ever you are used to and like. My drink mix changes all the time, I get tired of the same thing over and over. Gels? Bars? : I use Gus more than anything else. They are the easiest for me to eat when its cold and I'm breathing really hard. I will use chomps if its a little warmer. MAX TAAM: Max is one of the fastest skimo racers in America. He has represented the US at the World Championships the past four years and finished first at both the Power of Four, PowderKeg Teams Race and Four Peaks events last year. Skin type: Ski Trab, Coltex. More options, the better! Gloves: Ski Trab Piuma Duo. My hands get cold quick and these are the warmest ones with a wind mitt option. STEVIE KREMER: Stevie was born in Düsseldorf, Germany. She currently lives in Crested Butte, CO, and works as a second-grade teacher at the Crested Butte Community School. Skins: I'm a little unusual but I always carry an extra pair of skins in my speedsuit AND a pair in my pack-so a total of 3. I get SO nervous of freezing skins! Poles: I'm 4'11"...My poles are short! Goggles or glasses: I personally prefer goggles, especially when it's snowing. If it's warm and very sunny, I will wear sunglasses but keep goggles taped to my helmet. Socks: I use SKHoop light ski socks, they are awesome! Gloves: CAMP gloves with the wind shell that can be tucked away when going up are awesome! Drink and nutrition: I put Skratch in my water bottles and carry a couple PowerBar gels, but I prefer the PowerBar Chews.